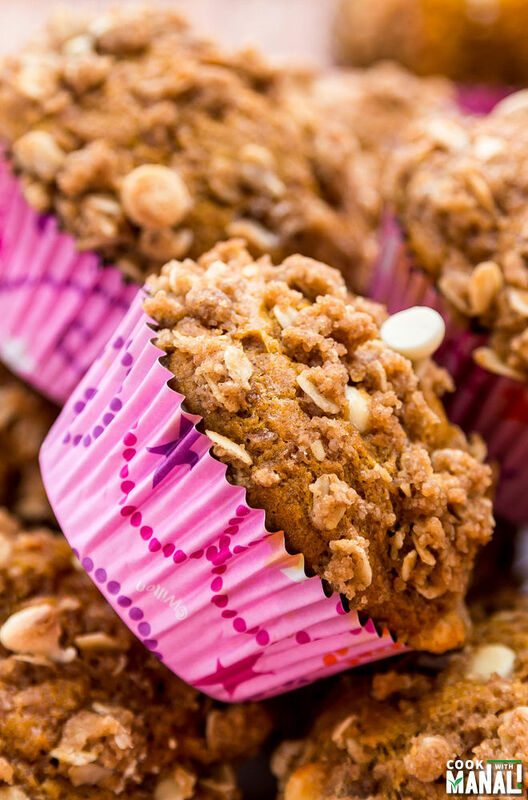 Pumpkin Streusel Muffins – most pumpkin muffins topped with delicious oats streusel. Perfect for fall! There are pumpkins everywhere. Literally. Yesterday I went to Trader Joe’s and all I could see was pumpkin and pumpkin products. There was pumpkin butter, pumpkin bars, pumpkin chai, pumpkin cereal, pumpkin ravioli, pumpkin granola, pumpkin oatmeal and 10,000 other stuff which I can’t seem to remember! Didn’t I say there are pumpkins everywhere! There’s no escaping them during this time of the year. And so it was obvious that I couldn’t have stayed away from a pumpkin recipe for too long. 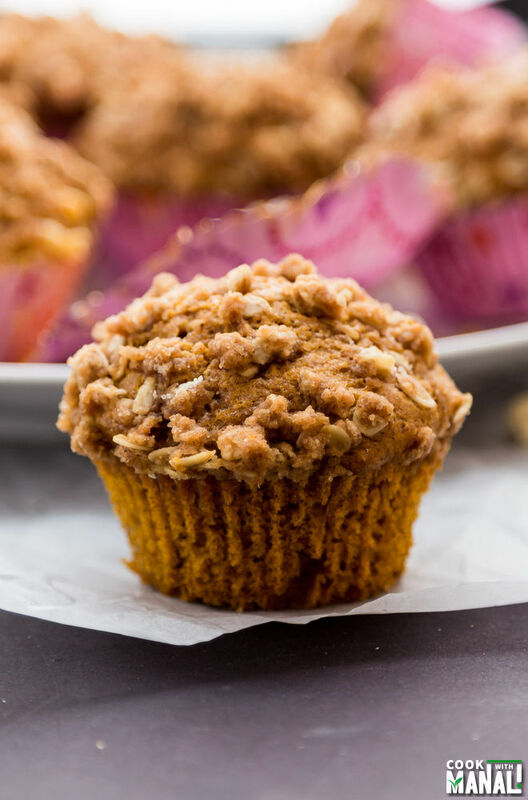 Today’s pumpkin streusel muffins are one of the best muffins I have ever baked. 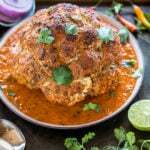 They are tender, moist and bursting with pumpkin flavor. So good! 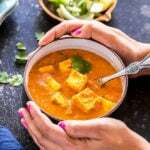 I used canola oil and greek yogurt in this recipe and highly recommend them. 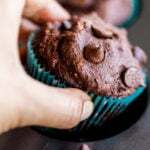 These 2 ingredients really made the muffins super moist. And like I always say the key to a soft tender muffin is to mix the batter till just combined. Over-mixing will result in a hard muffin which no one wants to eat! I also sprinkled some white chocolate chip on top but that’s optional. Honestly speaking I am not a big fan of white chocolate but it went well these muffins. 1. Bake initially at a higher temperature. This high temperature causes the air bubbles in the batter to expand which lifts the batter and you get these nice muffin domes. 2. Fill the muffin pan/liners all the way to the top with the batter, only then it will be able to form a high rising dome. 3. The muffins should be baked in the upper third of the oven where heat is more constant. For the streusel topping I used both oats and flour. I really like baking with oats, I think it adds such a nice texture to baked good and these muffins were no different. 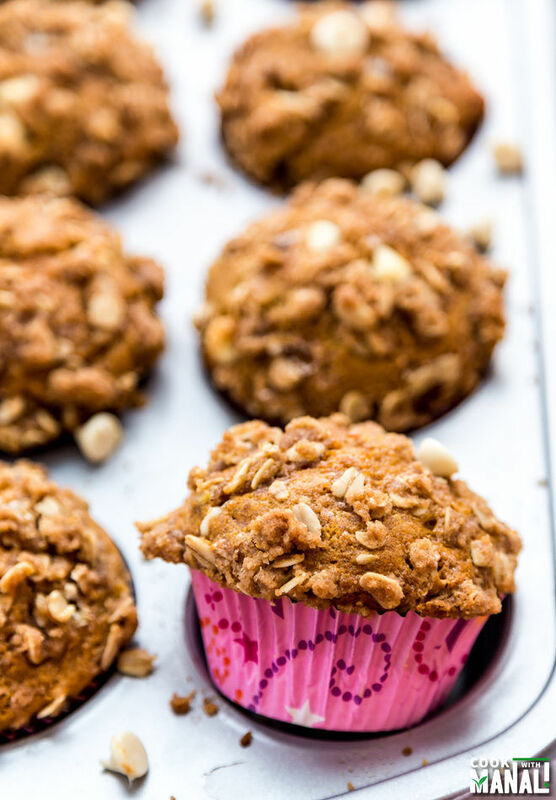 The brown sugar and oats streusel was perfect with these moist pumpkin muffins. 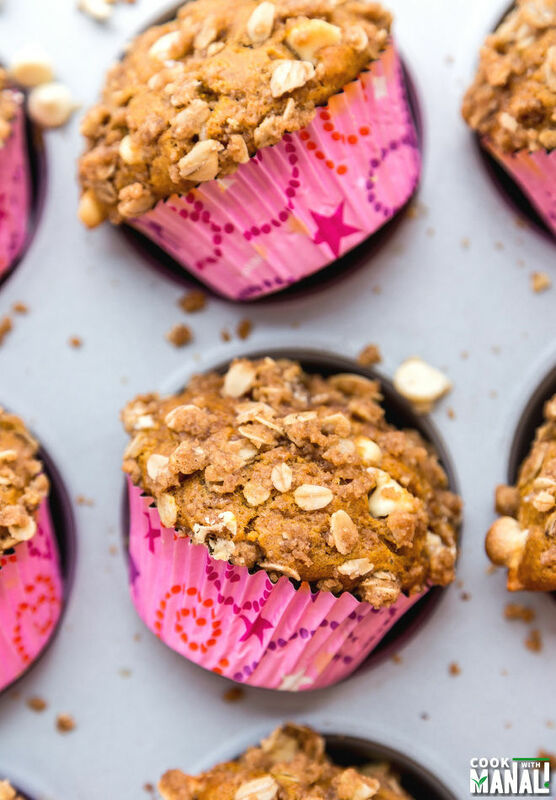 I had these pumpkin streusel muffins for breakfast today and I think they tasted even better the next day. These are perfect muffins for fall morning with a cup of coffee. 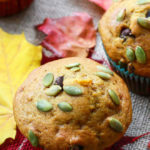 Get you pumpkin fix and make these muffins! * For a less sweeter option, cut down on the sugar in the streusel topping. Use 1/4 cup in stead of 1/3 cup sugar. * The muffins stay good at room temperature for a few days. It’s best to freeze the muffins which you are not going to eat rightaway. * I was able to get 12 big muffins out of this batter because I filled them all the way to the top to get these muffin domes. If you don’t care about the domes, you can fill less batter in each liner and get more muffins! 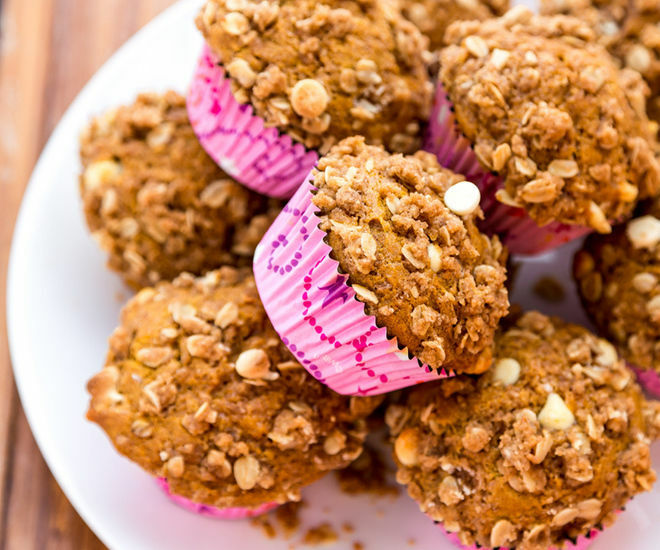 Moist and tender Pumpkin Muffins topped with a brown sugar and oats streusel. In a bowl mix together all purpose flour, oats, light brown sugar and cinnamon powder. Melt butter in the microwave till completely melted. Add the melted butter to the dry ingredients and mix till the mixture resembles bread crumbs. Set aside. Line a muffin tray with liners or spray with a non-stick spray. Set aside. In a bowl whisk together all purpose flour, cinnamon powder, pumpkin pie spice, salt, baking powder and baking soda. Set aside. In the steel bowl of your stand mixer fitted with paddle attachment or using your hand mixer, beat together eggs and granulated sugar till well combined, around 2 minutes. Add in the vanilla, greek yogurt and oil and mix till everything is well combined. Add in the pumpkin puree and mix. Start adding the dry ingredients into the wet. Add the dry ingredients in 3 parts, mixing after each addition. Mix in till the batter is just combined. Do not overmix. Pour batter into the liners/muffin pan and fill it all the way to the top. 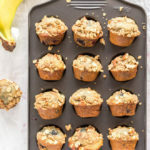 Sprinkle each muffin with around 1 tablespoon streusel. Also sprinkle some white chocolate chips [if using]. Bake at 425 F degrees for 5 minutes, lower the temperature to 350 F degrees and bake for another 15-17 minutes or till a toothpick inserted in the center comes out clean. Mine were done in 15 minutes. Let the muffins cool in the pan for 5 minutes before transferring them onto a wire rack to cool completely. Thanks Medha! Yup, me too a streusel fan! Heck yes! These muffins look amazing! I am a sucker for streusel topping, which you probably already know! These look perfectly moist and I love that you used greek yogurt and oil! The winning combo for moist muffins. Pinned! haha yes Lindsey I know how much you love streusel and filled cupcakes 😉 Thanks for pinning! Hah! Must be great minds think alike 😉 i’ve got a pumpkin cupcake and you’ve got a pumpkin muffin, let’s trade! Aw man! Don’t tempt me with such utter scrumptious bliss! Allll about it, per usual! Those muffins look absolutely perfect Manali! I love the streusel topping, and that photo with them all sideways in the tin is beautiful! 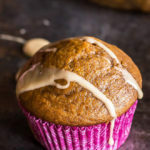 I love Greek yogurt in muffins too, such a great way to make them healthier but still nice and moist. Thanks Stacey! I’m glad you liked it 🙂 yes greek yogurt is great in muffins, really makes them moist! These are beautiful muffins Manali, and I’m a huge fan of white chocolate myself, so I”m loving that! And I had no idea there was pumpkin butter & pumpkin chai! I love learning new things like that! Pinned! Thanks Kristi! Oh you have no idea, like I said I can’t even remember half of the stuff…all I could see inside the grocery store was Pumpkin! Thanks Michele! I love pink too! These look sooo good! That streusel topping looks like heaven, and your photos are amazing. Wish I had one right now! Thanks Rachel! 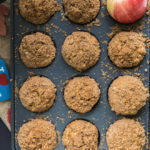 the streusel was the best part about these muffins! I like that you added oats to this. I think oats really make a muffin a bit more hearty. 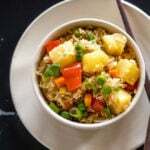 I love to use oats in my baking recipes Dannii! Of course they are healthy but I also love the texture they impart to baked good! Who doesn’t love streusel?! These muffins look fantastic, Manali. Thank you Angie! 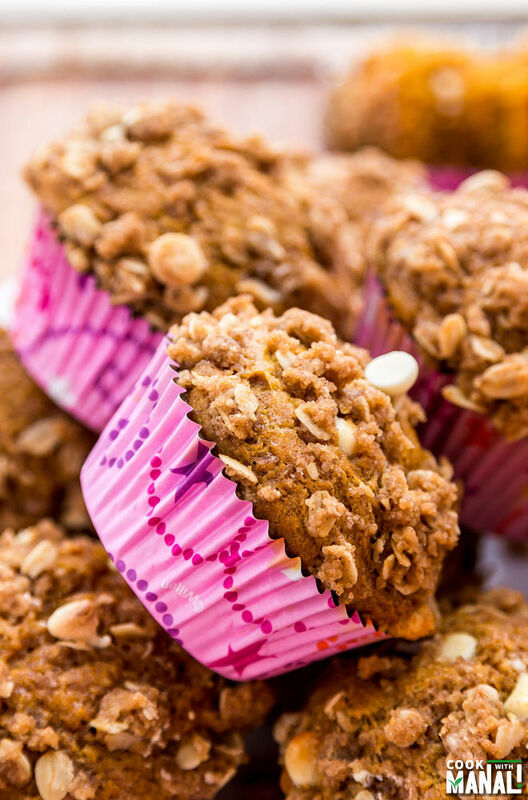 easily the streusel topping is the best thing about these muffins! These muffins look wonderful Manali! Greek yogurt and oil produce the perfect moist muffin crumb! Pinning! I am in love with these muffins. Just look at the gorgeous muffin tops. They’re perfect. Pinning! Thanks Jen, glad you liked them! I love the looks of these muffins, Manali! That streusel topping looks so good. And I’m loving that you used Greek yogurt in these cuties, too! I always try to do that when baking. Pinned! Thanks for pinning Gayle! Yup greek yogurt works so well with muffins! Thank you Marcie 🙂 yeah I was kind of surprised to see so many pumpkin products, not that I mind either! thanks for pinning! Trader Joe’s is so dangerous! They make pumpkin pop tarts that I just CAN’T resist! I don’t think I could resist these, either. I love streusel on my muffins! Ooo you are so right! TJ’s in dangerous during this time of the year! I haven’t tried pumpkin pop tarts but can imagine they must be incredible! 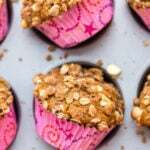 These muffins sound fantastic Manali – and I love that streusel topping! I am obsessed with pumpkin everything this time of year so can only imagine how happy I’d be walking into a TJ’s 🙂 Pinned! Thanks Ceara for pinning! Yes we are all little obsessed with pumpkin right now, ha ha! Twins! I made a version of pumpkins streusel muffins this weekend!